Set in the upper reaches of the Motithang area, this sixteen suite lodge lies in close proximity to the many attractions of the capital city of Thimphu. Situated in a blue pine forest in the upper reaches of the Motithang area of the Thimphu Valley, the 16-suite Amankora Thimphu is close to the capital’s sights and shopping, while remaining a quiet retreat away from the hustle and bustle of the Kingdom’s main commercial centre. 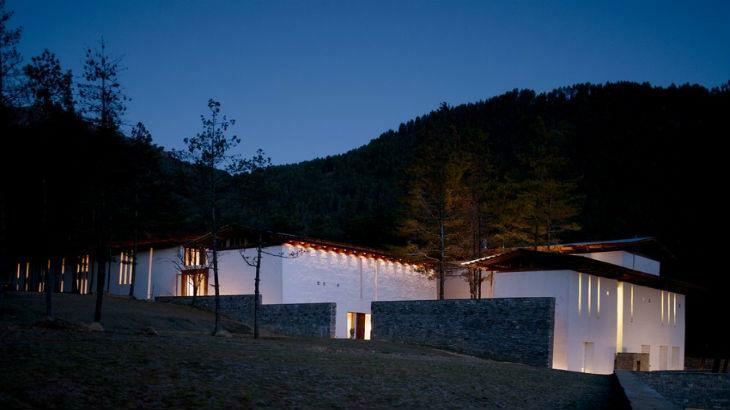 The resort’s dzong-inspired architecture incorporates whitewashed stone buildings accessed through an enclosed arrival courtyard. Stairs lead from this entryway to a Combined Living and Dining Room with soaring ceilings and wood-panelled walls. An outdoor dining deck provides views of the nearby stream and surrounding forest. The spacious library houses a collection of books on Bhutan and can also be converted into a state of the art meeting and conference room. 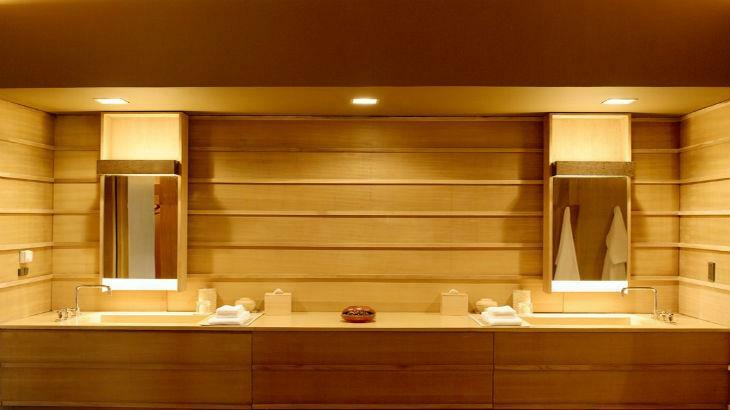 The Spa features three treatment rooms (two single and one double), a steam room and changing areas. The boutique specialises in a fine collection of Bhutanese textiles, Himalayan art and jewellery. Suites combine a bedroom and lounge and feature a king-size bed, a reading chair and a window banquette. This provides views across a landscaped courtyard, or of the stream and pine forest. A traditional Bukhari was positioned between the bedroom and the bathroom. 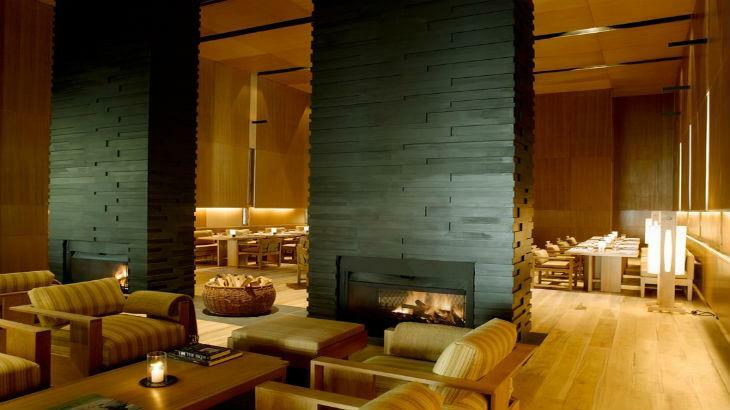 The suite’s interior features wood panelling and chocolate brown walls. The spacious bathroom opens from the bedroom and provides twin vanities, separate shower and toilet, hanging space and a terrazzo-clad bath. The suites are individually heated during cold winter months. Amankora Thimphu offers guests a unique opportunity to shop and sight see in Bhutan’s capital and to take treks into the region’s wilderness. Few hikes are as rewarding in terms of scenic beauty and insights of Buddhist architecture, craftsmanship and mysticism as the half day hike to Dodedrak; a beautifully situated, magical monk village established around a mysterious 12th century temple. Here you will not only find true tranquility, but also impressive art in form of original 900-year old paintings, remarkable mandalas, and the history of Dodedrak told in the form of a painted stone wall shaped like the images themselves. Bring some snacks, join the monks for lunch and make sure to take plenty of time to let the mystery of Dodedrak reveal itself before you return to the real world. Tshewang is a one-hour ritual performed by five to six monks to promote long life. It involves ample prayers, mantras and final blessings using Dorji (Thunderbolt) as well as sacred scriptures touched to the head. This elaborate ceremony can be arranged in one of the monasteries in Thimphu valley. One day notice is required for the preparation. US$180++ per person or couple. The temple Pangri Zampa appeared in Zhabdrung Ngawang Namgyal's vision that directed him from Tibet to Bhutan. Built by Ngawang Choegyel, the great-grandfather of the Zhabdrung, was the Zhabdrung's residence when he arrived in Bhutan in 1616. Today, the temple is used as the astrology centre of the state clergy and is the home to around 100 monks studying astrology. During a visit to Pangri Zampa, you can learn more about astrology, and also have your personal reading done. US$70++ per reading.